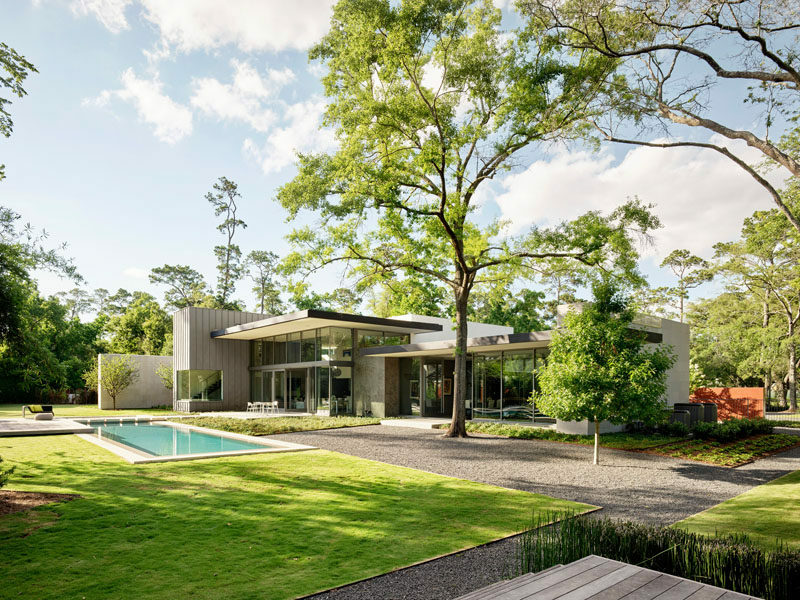 Ehrlich Yanai Rhee Chaney Architects has designed a modern house on a two-acre wooded site in an upscale neighborhood in Houston, Texas, for two doctors that wanted a place to unwind from the pressures of work, and an oasis to share with their two kids and extended family and friends. 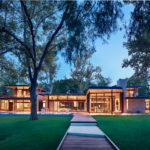 The home has been designed with large expanses of glass alternating with masses of Texas limestone, and the backyard has a swimming pool and plenty of space to relax. 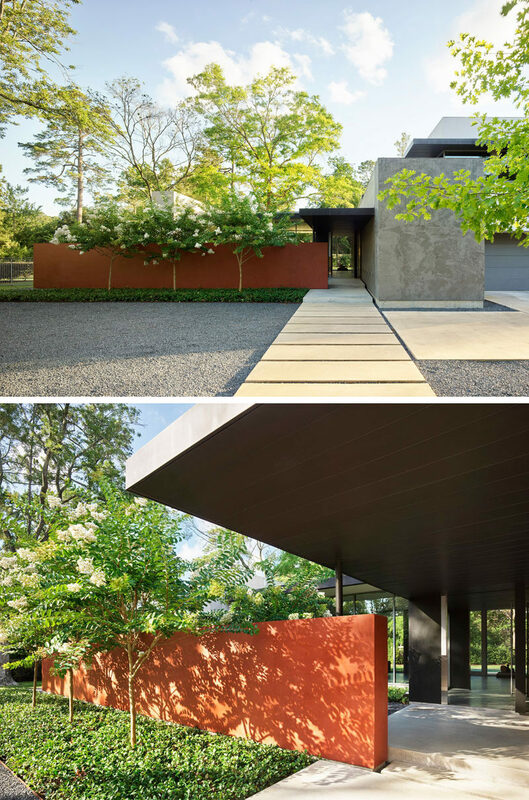 Horizontal roof planes with deep overhangs were used in the design of the house to mitigate Houston’s sun and heavy rains. Inside, a limestone wall surrounds a fireplace, while the floor-to-ceiling windows provide views of garden. 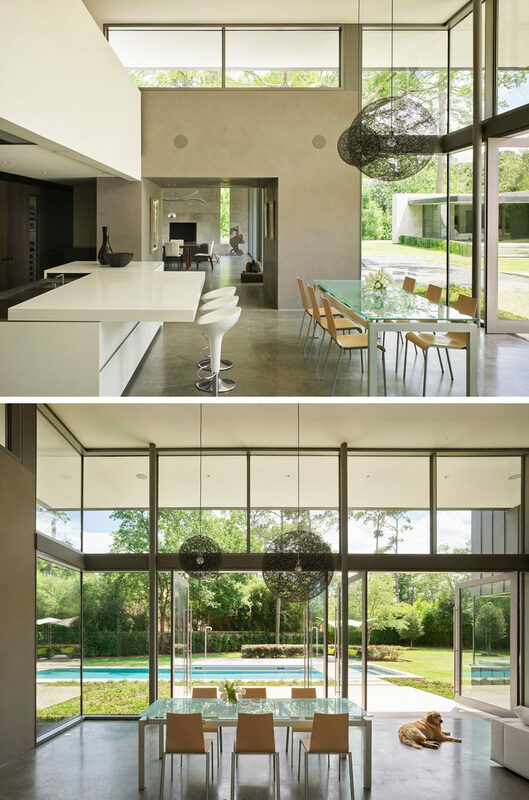 At the heart of the house is a double-height great room encompassing family living, a dining area and kitchen. 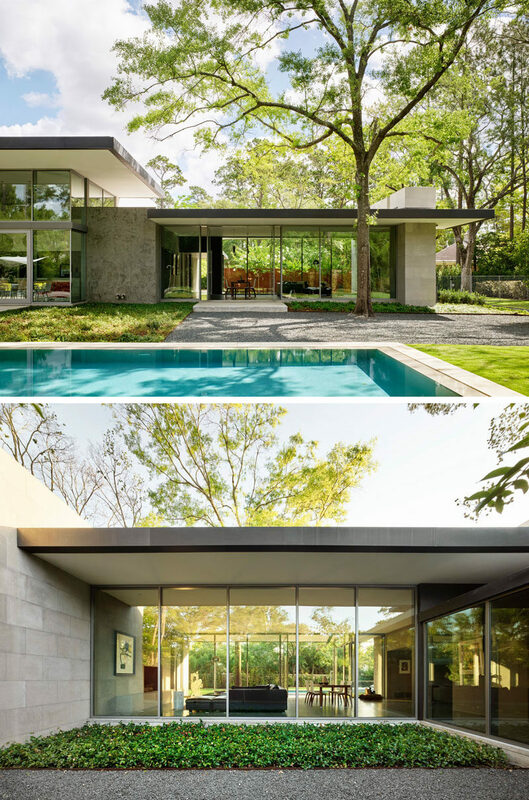 Pivoting glass doors in the dining and entertaining areas open to the pool courtyard. Another limestone wall adds a natural touch to the mostly white interior, while the floor is a natural grey poured concrete. The master suite at the back of the house is soothingly minimal, with the bedroom, spa bathroom and study all opening to secluded gardens. 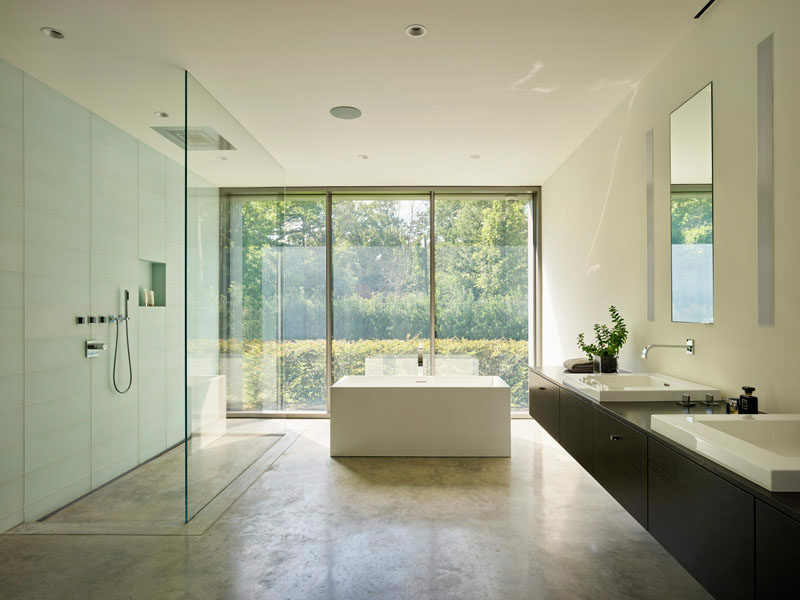 In the master bathroom, a large glass enclosed shower sits beside a freestanding bathtub. 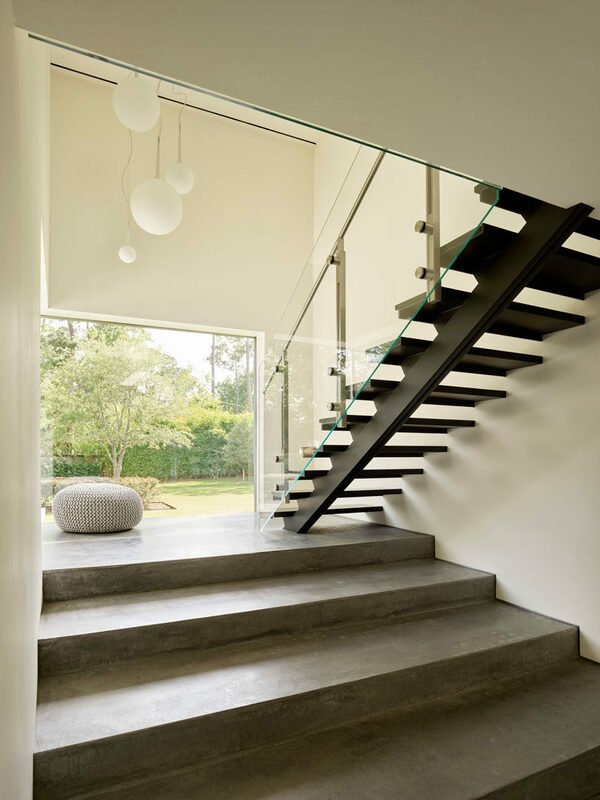 The staircase provides a contrast in materials, commencing from the ground plane as three broad concrete amphitheater steps, then transforming into black steel treads and glass as it ascends further. Upstairs, there’s a children’s wing with a playroom and study that overlooks the main social areas of the house.